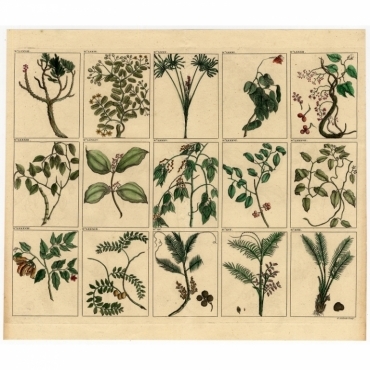 Antique prints of plant life including antique prints of flowers, trees and plants. 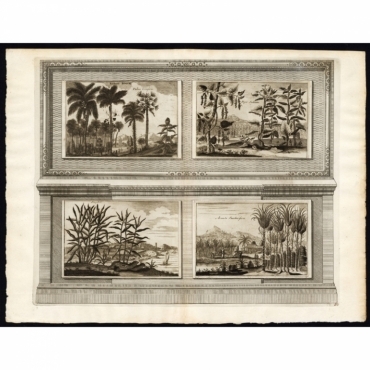 We offer antique botany prints for every budget including antique prints published by Knoop, Calmet, Dapper, Nieuhof and other artists and engravers. Antieke prenten van plantenkunde zoals antieke prenten van bloemen, bomen en planten. Bij ons vindt u antieke plantenkunde prenten voor ieder budget zoals antieke prenten gepubliceerd door Knoop, Calmet, Dapper, Nieuhof en vele andere artiesten. 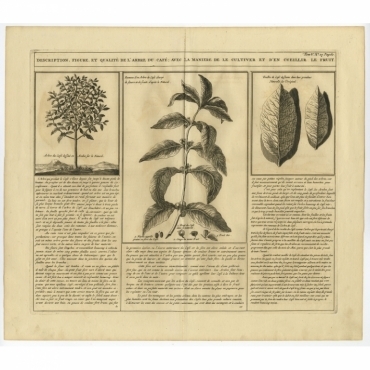 Antique Prints | Botany There are 147 products. 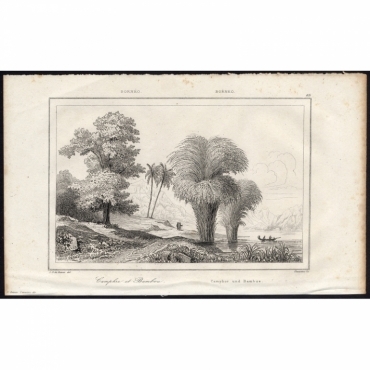 Print/scene: 'Kokos Boom / Palma coccifera - Piper Indicum - Zingiber - Arunda saccharifera.' (Cocos palm - Indian pepper - Ginger - Sugar reet.) 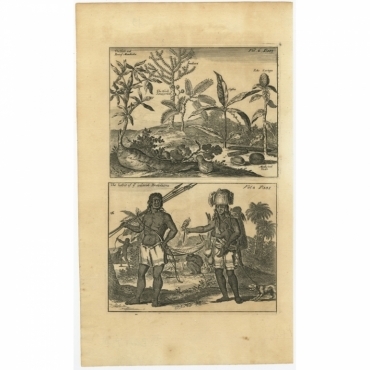 Spices and crops of the East-Indies. Extremely rare in this edition. 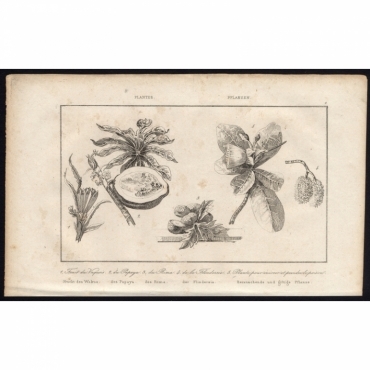 Antique print, titled: 'Fruit du Vaquois, du Papaya, du Rima, de la Flindersie, Plante pour enivrer et prendre la poison - 2, Plantes', Various asian fruits: screwpine fruit, papaya, breadfruit and flindersia. Location: non specified Oceania. 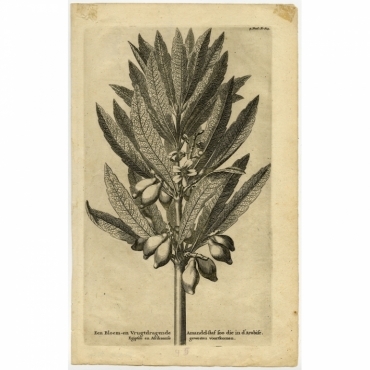 Antique print, titled: 'Plante de Phormium-tenax - 297, N.elle Zeeland', New Zealand flax, or Flax lily, Phormium. A New Zealand plant species. 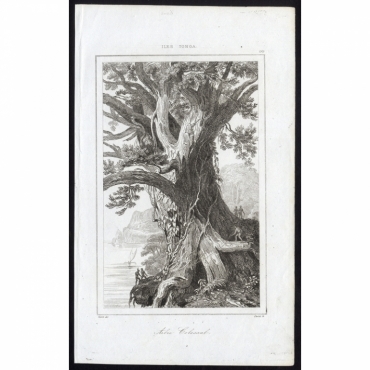 Antique print, titled: 'Arbre Colossal - 195, Iles Tonga', A collosal tree on the Tonga islands. Antique print, untitled. 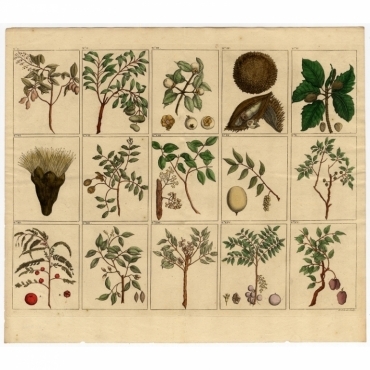 This is a coloured print of fruit and trees native to Southeast Asia. Antique print, untitled. Various species of palms, fruit and trees from South East Asia. Plate 20: 'Afteeckeninge van de note-moschaten.' (Depiction of nutmeg from Banda Islands, Indonesia.) Rare. Antique print, titled: 'Camphre et Bambou - 63, Borneo', Camphor tree (Cinnamomum Camphora) and Bamboo in a landscape with a lake (and a small rowboat). Antique print, titled: 'Een Bloem- en Vruchtdragende Amandel-Staf soo die in d'Arabise Egiptise en Afrikaanse gewesten voortkomen.' - ('A flower- and fruit-bearging almond Almond branch as it occurs in Arabia, Egypt and Africa'). Antique print, titled: 'Description, figure et qualite de l'arbre du cafe avec la maniere de le cultiver et d'en cueillir le fruit.' - Large engraving showing the coffee plant and bean. Descriptive text in French below the images. Antique print, titled: 'Reichenbachia - Tab 87 - Phalaenopsis casta.' 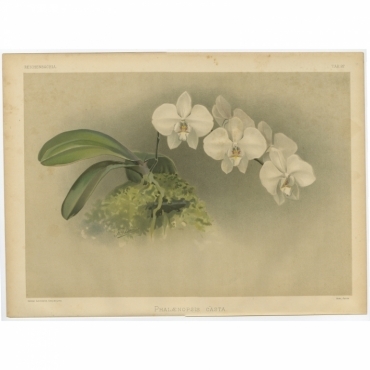 - Gorgeous / impressive large folio size antique print of the Orchid: Phalaenopsis casta. Includes original 2 page sheet with descriptive text (English, French, German) Rare / scarse. Antique print, titled: 'Reichenbachia - Tab 11 - Paphinia rugosa / Zygopetalum xanthinum.' 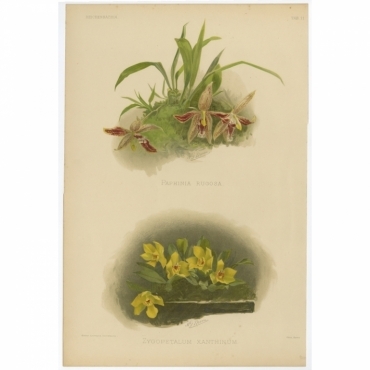 - Gorgeous / impressive large folio size antique print of the Orchid: Paphinia rugosa and Zygopetalum xanthinum. Includes original 2 page sheet with descriptive text (English, French, German) Rare / scarse. Antique print, titled: 'Reichenbachia - Tab 27 - Selenipedium hybridum nitidissimum.' 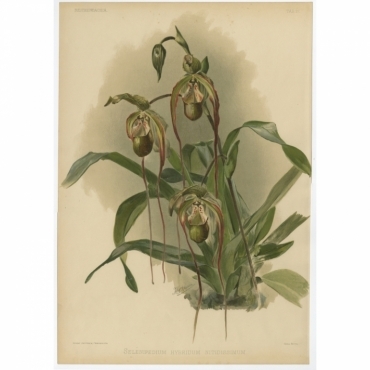 - Gorgeous / impressive large folio size antique print of the Orchid: Selenipedium hybridum nitidissimum. Includes original 2 page sheet with descriptive text (English, French, German) Rare / scarse. 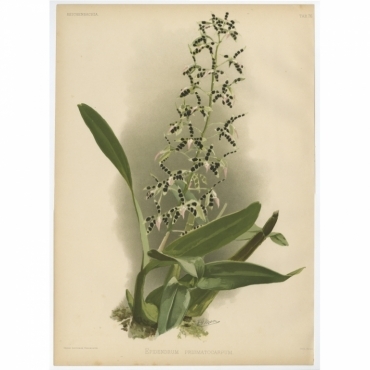 Antique print, titled: 'Reichenbachia - Tab 76 - Epidendrum prismatocarpum.' - Gorgeous / impressive large folio size antique print of the Orchid: Epidendrum prismatocarpum, Panarica prismatocarpa, Prism-Shaped Seedpod Panarica. Includes original 2 page sheet with descriptive text (English, French, German) Rare / scarse. 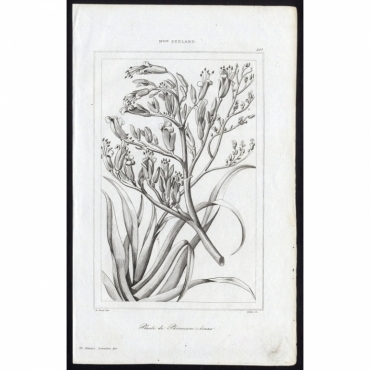 Antique print, titled: 'Reichenbachia - Tab 67 - Angraecum caudatum.' 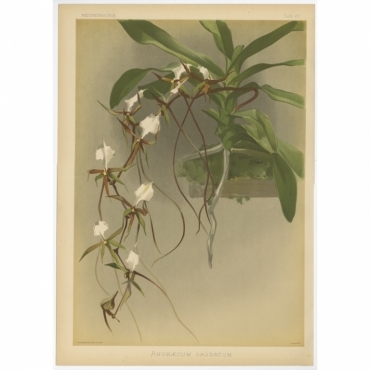 - Gorgeous / impressive large folio size antique print of the Orchid: Angraecum caudatum, The Long-Sepaled Plectrelminthus. Includes original 2 page sheet with descriptive text (English, French, German) Rare / scarse. 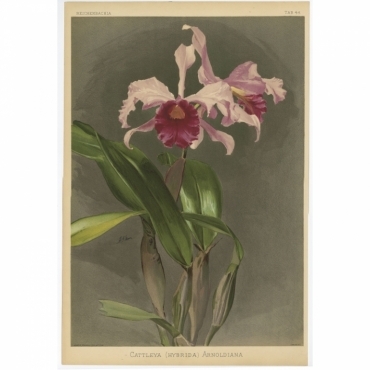 Antique print, titled: 'Reichenbachia - Tab 47 - Cattleya amethystoglossa.' - Gorgeous / impressive large folio size antique print of the Orchid: Cattleya amethystoglossa, amethyst-lipped Cattley flower. Includes original 2 page sheet with descriptive text (English, French, German) Rare / scarse. Antique print, titled: 'Reichenbachia - Tab 48 - Cattleya Hybrida Arnoldiana.' 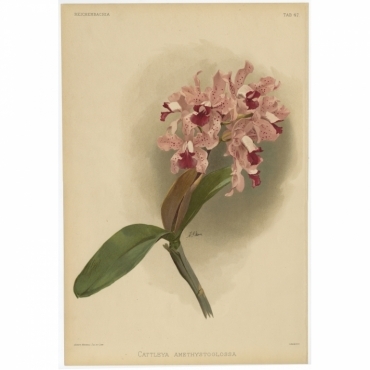 - Gorgeous / impressive large folio size antique print of the Orchid: Cattleya Hybrida Arnoldiana. Includes original 2 page sheet with descriptive text (English, French, German) Rare / scarse. Antique print, titled: 'Reichenbachia - Tab 2 - Cattleya Bowringiana.' 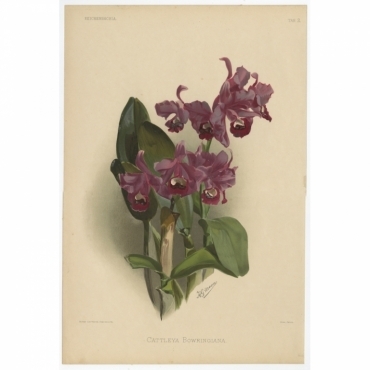 - Gorgeous / impressive large folio size antique print of the Orchid: Cattleya Bowringiana or Bowring's Cattleya. Includes original 2 page sheet with descriptive text (English, French, German) Rare / scarse. Antique print, titled: 'Reichenbachia - Tab 75 - Cattleya labiata Gaskelliana.' - Gorgeous / impressive large folio size antique print of the Orchid: Cattleya Gaskelliana, Gaskell's Cattleya. Includes original 2 page sheet with descriptive text (English, French, German) Rare / scarse.